DARPA (the US Defense Advanced Research Projects Agency) is well known for big, expensive and frankly terrifying robots like Big Dog, but for its latest project it's thinking much smaller. 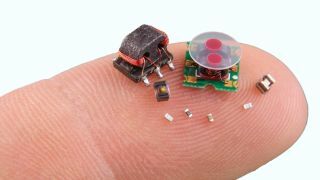 The agency has announced a new program called SHRIMP (SHort-Range Independent Microrobotic Platforms), to create a new generation of micro-robots small enough to fit on a fingertip. Big Dog can pick its way across uneven terrain in combat zones and disaster areas, but its size means there are some areas it simply can't pass. An insect-sized robot could scurry through rubble and obstacles unhindered – provided the technology can be made small enough. DARPA is challenging teams of researchers to create and demonstrate tiny robots capable of carrying out complex tasks in the field, striking a tricky balance of size, power and dexterity. Each team's tiny bots will be put through an "Olympic-style evaluation" that will test maneuverability (on flat surfaces and slopes), speed, and load-carrying ability. “While the goal of SHRIMP is develop small-scale, independent robotics platforms, we anticipate that discoveries made through our actuator and power storage research could prove beneficial to a number of fields currently constrained by these technical challenges – from prosthetics to optical steering," said DARPA program manager Dr Ronald Polcawich.